This game had everything — fighting the elements, drama out of the gate, back-and-forth action, a crazy finish and all of it on the highest stage. Coming in with an unbeaten record, Albemarle was looking to pick up its third state title since 2012. 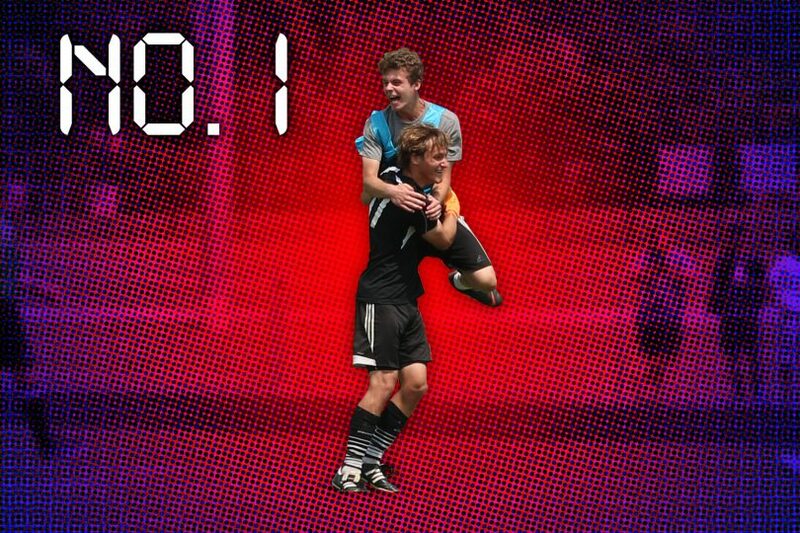 And with the Patriots’ Daniel Starr forcing an own goal from the WIldcats in the opening minutes, there pressure was on. Of course it flipped over with the Wildcats going up 2-1 before Albemarle even things up at 2-2 thanks to Wes Chaulk. The second half was a trade of goals with Deep Run grabbing theirs first and then Nicholas Maltovelli evening things up at 3-3. Then it was off to overtime where the Patriots pounded the Wildcats for 20 minutes but had nothing to show for it with the Deep Run defense somehow getting out of jam after jam. So on to penalty kicks it went. It was brief. 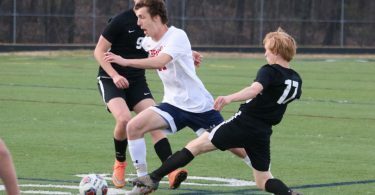 Albemarle goalkeeper Thomas Leckrone saw three shots and saved all three to lead the way to the win 3-3 (3-0) and wrap up an undefeated season. With neither team leading by more than a goal and playing in excessively hot and sunny conditions, this state final was gruelling and it was truly a fight to the finish with Deep Run playing an underdog role but answering the call and giving Albemarle all it could handle and then some. The Patriots resiliency won the day. More than a handful of teams, public and private, won state titles in 2017-2018. But none of them were as thrilling, as unpredictable as what happened on the last Saturday of the high school sports calendar at Glen Allen High. To call Western a heavy underdog coming into their Class 3A final four matchup with Northside is putting it mildly. it was essentially a home game for the Vikings with game in the Salem Civic Center and while the Warriors were riding a four game winning streak in the playoffs, Northside’s 29-0 record spoke for itself. But, as they say, this is why you play the games. Western did not apologize for its record, nor did the Warriors play like this semifinal was a swang song for its senior class. The Warriors kept things close enough in the first half to give themselves a fighting shot. Behind a huge game in the post from Tommy Mangrum and then clutch play from senior Chris McGahren down the stretch the Warriors kept pace, forced overtime and held off the Vikings behind some solid free throw shooting. Western fell in the state final to John Marshall, but there’s no getting around the Cinderella role they played in the Class 3A tournament. This team was leaps and bounds better than the one it took the floor with in December and January. Western’s progress might have been overshadowed by the seasons Albemarle and Lousia County had, but once the Warriors branched off into their respective playoff bracket, they showed exactly why this program is perennially one of the best in the area. Getting to the final four was supposed to the crown jewel for Western for those looking from outside. The Warriors going into Salem and beating the Vikings to earn a spot in the state title game stands as the program’s greatest win. Trying to pick between the quality playoff games for the Lions in their wild run to the Class 4A championship game is really a can’t miss scenario . There were no bad games. But if ever it looked like the Lions were in real trouble, that a spirited run was just not in the cards it was in the first half in the second round of the Region 4D playoffs on the road against Monacan. Louisa had its back against the wall all half. The Lions looked out-gunned and as though they had finally met a squad that was too athletic. Wrong. It turns out, it was just a case of surviving the early blows and sticking the course. After Raquan Jones ended the first half with a point saving interception, the Lions owned the second half for a thrilling 35-28 win and that momentum carried over into the rest of the playoffs. After Monacan, Louisa had confidence on the road against Dinwiddie. At home against Lafayette, the Lions looked and played like the favorites. While a comeback effort came up short against Salem in the state title game, there was no question this Louisa team looked and played like it belonged it that game. By all measures, the road trip to Monacan tested Louisa’s character and grit like no other game before it. To watch it was truly a treat, and as we said above, the other playoff games on this run were also crazy by their own right. But this one really stood out. We’ve seen a lot of incredible buzzer beaters over the last decade, but J’Quan Anderson’s aggressive, willful bucket to end this instant classic sticks out. The shot for one, but it was also the defense that led up to that shot, where Anderson put on a clinic of aggressive, on-ball defense, nabbing six steals as part of an incredible effort. The Patriots had to rally from down seven at the break, with Cartier Key and Na’il Arnold playing a big role in the comeback, stepping up defensively against the taller, formidable Warriors. Chris McGahren scored 19 to lead the Patriots, including going 6-for-6 at the line. But Albemarle erased that strong effort against a team that eventually advanced to the state finals, with Anderson muscling his way to the rack and connecting with 1.8 seconds to play. 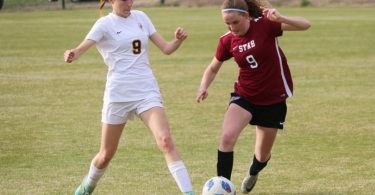 It’s certainly become the source for the best games in girls soccer over the past several seasons, but with Albemarle dominating the rivalry with a clean sweep of Western in the three years leading up to 2018, it wasn’t exactly a full tilt rivalry, though the schools have a natural rivalry. But Western Albemarle got on the board this year in the first of two meetings, a clash of two defending state champions. Both teams went at it and came up with one of the finest games of the year, a toe-to-toe battle that included Caitlin Harvey’s second half gamewinner and Savannah Wilson’s late penalty kick as the difference makers for Western. Besides giving Western’s seniors a long sought-after victory over the Patriots, it was also the Patriots’ first regular season loss since early in 2013. When the Lions made the trip to play the Patriots in December just a few days after a handful of its roster had played in the Class 4A football championship game, the writing was on the wall. While Albemarle took that first get-together, it was clear that the January 31st showdown in Mineral was going to be quite the show. As a program under Robert Shelton, Louisa County has made one stride after another. The ‘16-’17 campaign saw them become substantial role players and this year the Lions became one of the big dogs. With wins already over Western and Charlottesville, Louisa needed a win over Albemarle to keep pace with them at the top of the Jefferson District standings and, more over, to prove that they belonged in the conversation as one of the area’s top teams. In front of a energized crowd, the Lions got up early on the Patriots but a huge second half from J’quan Anderson helped Albemarle take control midway through the fourth. Down by two with seconds on the clock, Chris Shelton came up with the biggest shot of the season for the Lions. His 3-pointer propelled the Lions to a 59-58 win and was the launching point. Louisa advanced to the Region 4D semifinals to complete an impressive turnaround for a senior class that didn’t get to win a lot of games as underclassmen. And of course, Albemarle was Albemarle. The Patriots shook off the loss, beat the Lions in the JD tourney and found a way to advance to a third straight Class 5A state tournament. All-in-all, this game was good for everyone and quite the show. There were two, while both were fantastic games with the second date only becoming lopsided in the seventh, the first meeting between the Flucos and Lions was a wire-to-wire game that saw great back and forth and a dramatic finish. When Fluvanna made to the trip to Mineral in April there was plenty on the line. Louisa was coming off a big road victory at Western and so the winner of this first game between the Lions and Flucos was true litmus reading for the Jefferson District. Four the better part of a decade now, the get togethers with the Flucos and Lions have been the most dramatic baseball the Jefferson District has had to offer. This year was no different, and with Fluvanna advancing to its first ever Class 3A final four and the Louisa just falling short of a Class 4A bid in extra innings of its Region 4D semifinal with Dinwiddie, it turns out these were two great teams doing battle in the second of April. There were three big swings of momentum in the this first meeting and it was a 3-run rally in the seventh that put Fluvanna on top. It was arguably the biggest regular season win for the Flucos that helped set up a young team for the playoffs with a postseason environment game in Mineral. In a sport dominated by efficient pitching, offensive explosions from both sides in a softball game are actually kind of rare. But when Monticello and Fluvanna softball locked up in the Region 3C quarterfinals, not even a 7-0 lead for the Mustangs was enough to stave off an incredible back-and-forth shootout that eventually ended with the Mustangs squeaking it out after the Flucos rallied to tie the game in the fifth and the clash eventually went to extras where Monticello prevailed 9-8 on Emily Clifford’s sacrifice fly to left. The game had a little bit of everything, with Hayley Shifflett scoring all seven of those early runs on a three-run jack and a grand slam while Fluvanna had Tori Kozcan and Kendall Gordon each ripping two-RBI doubles. Sure, it was a holiday tournament game, essentially an early season tune up — no stakes, nobody’s season hung in the balance. But neither Albemarle or St. Anne’s-Belfield played like that when the two programs met up in the Holiday Classic championship game, a rare clash between public and private schools where STAB got the upper hand and led by as much as 12 points in the third quarter. A strong effort by Nick Reese and Mesiah Woods in particular seemed to givve the Saints control of the contest. But then J’Quan Anderson put the Patriots on his back, scoring 28 points on the night in an explosive, resilient effort. That set the stage for what happened in the closing seconds, when Maxx Jarmon took off, streaking down the court, covering the length of the floor in four seconds before releasing the ball for a lay-up that went in and completed the comeback at the buzzer in an 88-87 thriller. In a year where, as far as the Jefferson District was concerned, Louisa County was about 40 points better than the rest of the league on any given night, there wasn’t a lot of regular season drama. But the season finale between Charlottesville and Monticello was a wild one, a 55-41 win by the Black Knights where quarterback Sam Neale got it done through the air to help CHS clinch a playoff berth. In uncharacteristic fashion for the triple-option based Black Knights, Neale and his receivers led by Jake Poe and Rakeem Davis unleashed five touchdown passes, more than they had all season before that game. Monticello countered with a rally that pulled them within a touchdown in the second half, but a huge interception by Charlottesville’s Cam Brown late helped end the hopes of a comeback. Neale’s draw-it-in-the-dirt toss to Ben Casarez for a touchdown with 6:20 left that help put the Mustangs away.